Western blot analysis of lysates from Raji (human), BaF3 (mouse) and C6 (rat) cell lines using Survivin (71G4B7E) Rabbit mAb. Western blot analysis of extracts from HeLa cells, transfected with 100 nM SignalSilence® Control siRNA (Fluorescein Conjugate) #6201 (-) or SignalSilence® Survivin siRNA II (+), using Survivin (71G4B7E) Rabbit mAb #2808 and α-Tubulin (11H10) Rabbit mAb #2125. 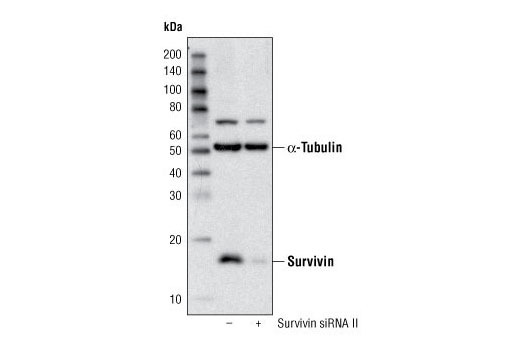 Survivin (71G4B7E) Rabbit mAb confirms silencing of survivin expression and α-Tubulin (11H10) Rabbit mAb is used to control for loading and specificity of survivin siRNA. 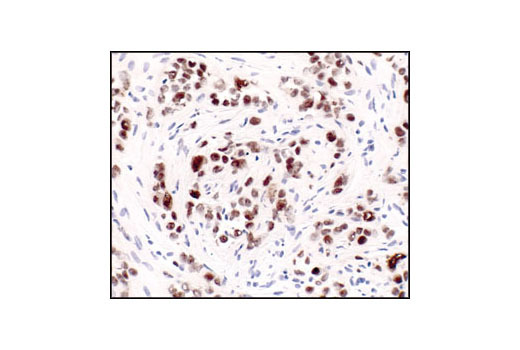 Immunohistochemical analysis of paraffin-embedded human transitional epithelial carcinoma of the bladder using Survivin (71G4B7E) Rabbit mAb. 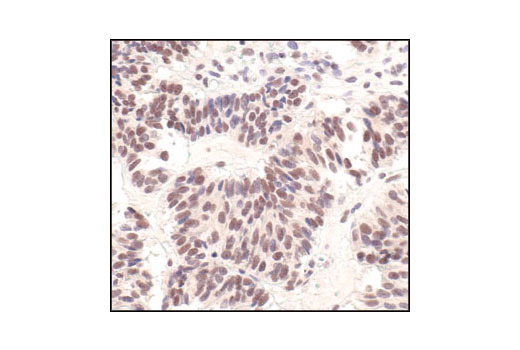 Immunohistochemical analysis of paraffin-embedded human lung carcinoma showing nuclear localization using Survivin (71G4B7E) Rabbit mAb #2808. 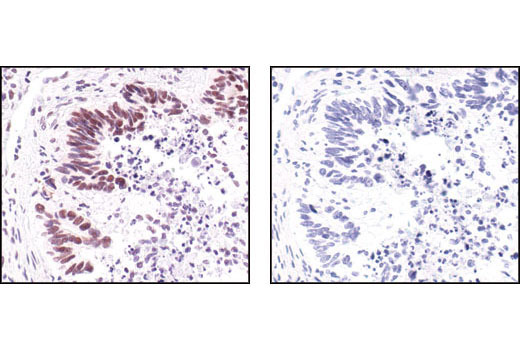 Immunohistochemical analysis of paraffin-embedded human colon carcinoma using Survivin (71G4B7E) Rabbit mAb in the presence of control peptide (left) or Survivin Blocking Peptide #1037 (right). 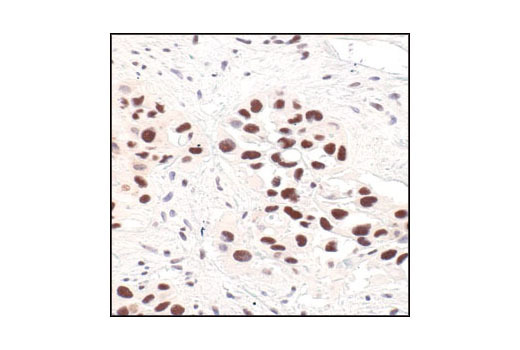 Immunohistochemical analysis of paraffin-embedded human pituitary adenoma using Survivin (71G4B7E) Rabbit mAb. 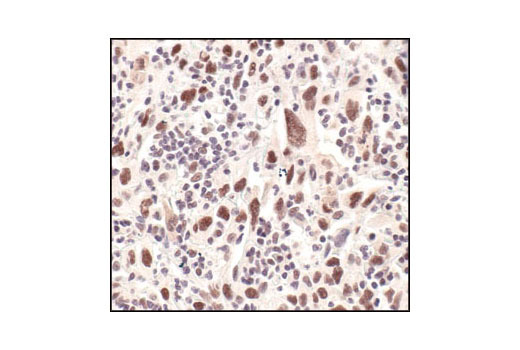 Immunohistochemical analysis of frozen H1650 xenograft showing nuclear localization using Survivin (71G4B7E) Rabbit mAb. Confocal immunofluorescent analysis of HeLa cells using Survivin (71G4B7E) Rabbit mAb (green). 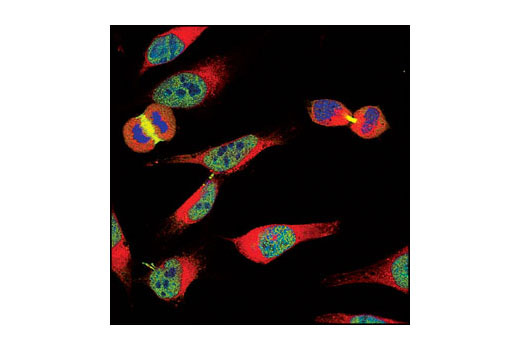 Mitochondria have been labeled with MitoTracker® Red CMXRos (red). Blue pseudocolor = DRAQ5® #4084 (fluorescent DNA dye). 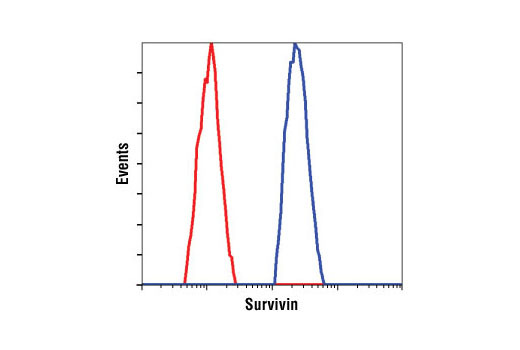 Flow cytometric analysis of untreated Jurkat cells using Survivin (71G4B7E) Rabbit mAb (blue) compared to a nonspecific negative control antibody (red). 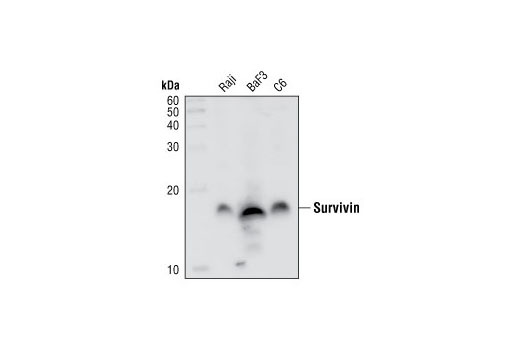 Survivin (71G4B7E) Rabbit mAb detects endogenous levels of total Survivin protein. Monoclonal antibody is produced by immunizing animals with a synthetic peptide corresponding to residues surrounding cysteine 60 of human Survivin. Survivin is a 16 kDa anti-apoptotic protein highly expressed during fetal development and cancer cell malignancy (1). Survivin binds and inhibits caspase-3, controlling the checkpoint in the G2/M-phase of the cell cycle by inhibiting apoptosis and promoting cell division (2,3). This regulatory process requires the phosphorylation of survivin at Thr34 by p34 cdc2 kinase (4). Gene targeting using a Thr34 phosphorylation-defective survivin mutant, as well as antisense survivin, have been shown to inhibit tumor growth (5,6). Reed, J.C. and Reed, S.I. (1999) Nature Cell Biol. 1, 199-200. Li, F. et al. (1998) Nature 396, 580-584. Li, F. et al. (1999) Nat. Cell Biol. 1, 461-466. O'Connor, D.S. et al. (2000) Proc. Natl. Acad. Sci. USA 97, 13103-13107. Olie, R.A. et al. (2000) Cancer Res. 60, 2805-2809. Grossman, D. et al. (2001) Proc. Natl. Acad. Sci. USA 98, 635-640.